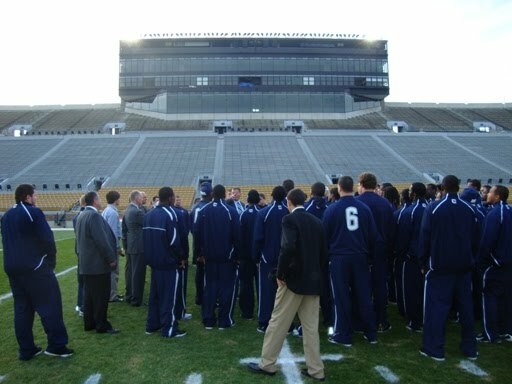 Here are a few pictures from UConn's walk through at Notre Dame Stadium on Friday afternoon. Thanks to WTIC color man/photographer Wayne Norman for the images. 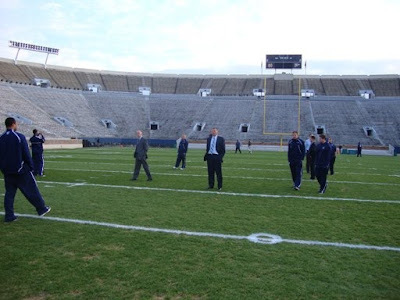 Wayno must have missed the Randy Edsall/Gene Hackman tape measure scene, but much appreciated anyway. Enjoy. 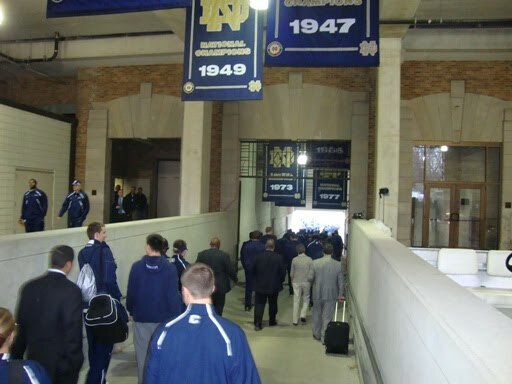 Under the national championship banners from 60 years ago. Very intimidating. Randy Edsall about to do his Norman Dale impression. "I think you'll find it's the exact same dimensions as our football field back in East Hartford. OK. Let's get dressed for practice." 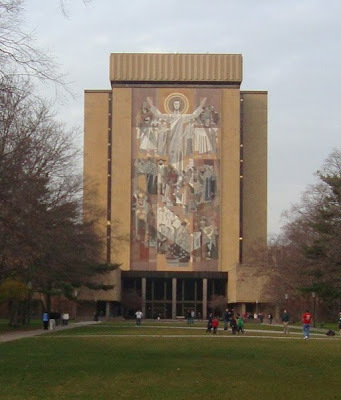 Touchdown Jesus. Not the least bit blasphemous. I still love it. Huge win!! Any chance el-amin is around chanting "we shocked the world"? 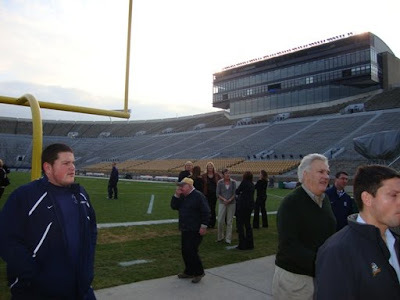 Hey chip, is there abyplace where I can watch a replay of the game? Hug win indeed. Keep up the great work. Chip, you must be pulling the hair out of your head - first the bowl game, now the greatest win in UCONN football history. Having attended the game this weekend, this was somethingsas special as any Yankee series game or Super Bowl that I have attended. For the register to not have first hand coverage of this monumental event is irresponsible by those who give you your marching orders, and they need to hear it from readers. Yale football is a 1900s event, and barely more interesting to local sports fans as the baseball Ravens or the hockey Beast. This was as exhilarating a sports game to be at as any, and I feel bad that you or any NHR reporter could not have been there in person. As a great pro, you deserve better, and more importantly to a professional reporter, local sports fans deserve better.